I remember reading seminars as follows: one student spends the entire week preparing for a powerpoint presentation, which often turns out to be stressful for the student and somewhat boring and uninformative for the audience. The other students only glanced over the paper and so any discussion quickly falls flat. I therefore decided to have multiple short presentations without powerpoint (less preparation, more fun to listen to, plus repetition is good for learning a skill). I also decided to use short writing assignments as homework to make sure that all students were prepared to contribute to the discussion in class. At the same time, I wanted to keep things manageable for everyone. 1. Learning to present: every student does multiple short presentations without powerpoint. No powerpoint: I didn’t want students to spend too much time preparing a presentation. I believe that often, when students spend a lot of time preparing presentations, they focus too much on making powerpoint slides and not enough on informing the audience and telling a story. Short presentations: Doing an engaging 45 minute presentation is extremely difficult, and a skill that most postdoc don’t have, so why do we use 45 minute presentations in our graduate seminars? I decided in stead to let each student do three 10 minute presentations. Feedback: After each presentation the presenters got feedback (from the other students and myself), so that they could improve their presentation skills during the semester. 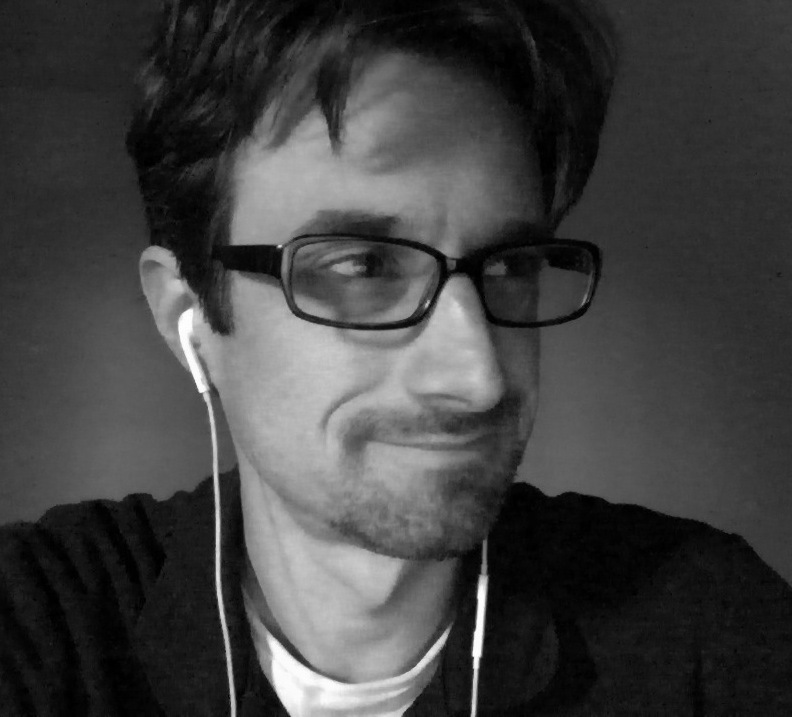 Easy listening: An added benefit of 10 minute presentations is that it is much easier for the audience. Each week started with three student presentations, one on the background and main question of the paper, one on the data and the results of the paper, and one on the conclusion and implications of the paper. 2. Practice writing: every student does a different writing assignment every week. Graded homework each week: A paper discussion can only work if people have read the paper. If students don’t read, they may spend most of their energy to try to hide that they didn’t read (I know I was in that situation!). So even though I understand that life and research get in the way of reading, I really wanted to make sure that the students were prepared for the seminar. To do that, I made every student do a written assignment every week that would count towards their grade (unless they were presenting that week). A different assignment for each student: I had a long list of assignments so that each week, many different assignments were done AND so that over the course of the semester each student did many different assignments. This guaranteed that the students read the paper, but each with a different question in mind. There were several types of written assignments. Descriptive: 1. Describe the background and main question of the paper, 2. describe the data and the results, 3. describe the conclusions, 4. describe which virus the paper is about. Critical: 5. What is your opinion of the paper? 6. What do you think the authors should have done differently? 7. Play the devil’s advocate: why should the paper not have been published? Summaries: 8. Summarize the paper in your own words, as if writing to a friend, 9. summarize the paper using only the most common 1000 words of the English language, 10. summarize the paper in a graphical abstract, 11. summarize the paper in a tweet. Meta: 12. Who are the authors of the paper? 13. How often is the paper cited, do you think it is influential? Short! Each written assignment could not be more than 150 words, to keep the workload manageable for me and for the students. Surprisingly hard: Some of the assignments were harder than the others. Summarizing the paper using only the 1000 most common words from the English language turned out to be very hard, but some of the students did a great job (see here and here). The graphical abstract was also hard for some students, but others liked it just because it was so different from their usual work (see here and here). The ”devil’s advocate” writing assignment was always very interesting to read. Easy: Grading the written assignments was quite easy. I simply gave a plus or minus for 5 categories (answered the question, scientific accuracy, clarity, grammar and word count). Revisions allowed: After a request from a student, I decided that the students could redo any assignment where they had gotten less than 100% because I believe that feedback is most useful when it can be applied to a revision. 3. Promoting equity: thanks to the written assignments, every student could contribute to every class. Sharing homework: I also encouraged the students to share their written assignments on the online forum we had for the class, so that the other students (and not just me) could read them. Sometimes they led to interesting forum threads. I also published some of the written assignments on my blog, after asking the students for permission. This way even more people could enjoy them. Ben Kerr, a professor at the University of Washington was one of only two faculty at the Gordon Research Seminar on Microbial Population Biology in the summer of 2013 (everyone else was grad student or postdoc). I asked him how he experienced the meeting. I have written about the Gordon Research Seminar and Conference previously here (link). If you are interested in microbial populations, and if you would like to meet others who are interested in microbial populations too, please consider signing up. If you are unsure whether you’d be a good fit for the meeting, feel free to send me an email (pennings at sfsu dot edu). Ben Kerr’s opinion: one of the most dynamic meetings I’ve attended! “The 2013 Gordon Research Seminar was really quite a wonderful meeting. As one of a few faculty members attending, I noticed some very positive deviations from a traditional small meeting (i.e., one featuring faculty). First, here was a chance to hear presentations of the highest quality by the graduate students and postdocs actually doing the research. This gave the session a tangible authenticity, featuring a unique perspective from those on the front line of research. Second, the atmosphere of this meeting was extremely welcoming and supportive. Constructive conversations about research, scientific communication, and professional development occurred both formally and informally throughout. More than many other meetings, the GRS gave a wider audience a voice (regardless of age, gender and background, which was truly refreshing). Third, the meeting allowed attendees to connect with others whose research complemented their own. Several members of my lab (including me!) made important contacts during the GRS, which have led to productive collaborations. Some notes about J1, H1B entry visas in Amsterdam, London. I feel like I’ve been to US consulates and embassies to get new entry visas a hundred times. In reality it is probably 5 times. Still too often! I’ve only lived in the US since 4.5 years, but I have had many short contracts and a new contract always means I get a new visa, and a new visa means I need a new entry visa. I was on a J1 for 3.5 years and am now on my second H1B. In London, there is a photo booth in the embassy, so no need to spend money and time beforehand to get pictures taken. Make sure to bring money (not sure anymore if coins are needed or bills are OK). I had my appointment on a Monday morning and got an email that I could pick up my passport from a spot in central London on Thursday. The US embassy in London is quite large and you can buy something to eat and drink inside. In Amsterdam, however, there is no photo booth, so you need to bring pictures. I brought pictures, but the background wasn’t white enough (sigh…) so I had to go and get new pictures taken. There is a place on the Roelof Hart Plein, called Foto Amsterdam (Roelof Hartstraat 4), that makes pictures for 12.50 Euros. A friendly local makes and prints pictures for US visa quickly. His shop opens at 9AM (but today, he was late and I had to wait until 9:15). Last time, I had my appointment on Monday and got my passport back by mail on Friday. This week is Christmas, I had my appointment on Tuesday the 24th of December and got my pasport back by mail on Thursday the 1st of January. One of the most fun things about teaching a grad seminar last semester was reading the homework assignments. Seriously! Before I move on to the next semester (teaching genetics for undergrads), I wanted to share one more homework assignment. This one by Emily Chang, a graduate student in Scott Roy’s lab. 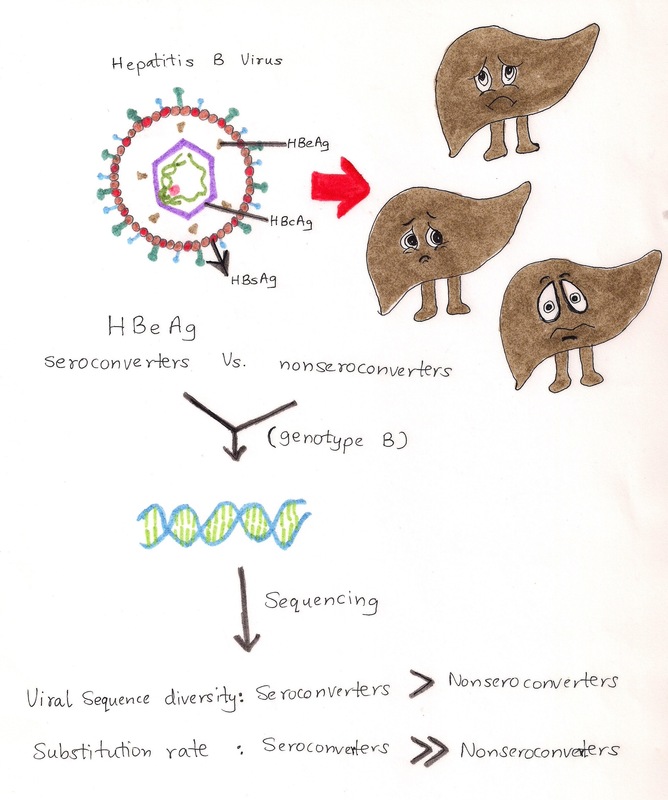 The paper about viral quasispecies in Hep B was one of the harder ones for the students, but this graphical abstract very neatly sums up the main results. I also love that Emily used old fashioned paper and pens to make the abstract, knowing that using fancy drawing software isn’t needed to communicate science.